As I've discussed before I love to snack. There are days that I eat six small meals a day instead of 3 large ones. When I learned from my doctor that I had to go gluten free I struggled with snacks the most. I have always loved carbs, especially breads and waffles. Pre-packaged gluten free snacks are not that delicious and I only buy them if I am starving and have no other options. It's hard when I am hungry and there is nothing that I can eat in the cupboard. Since my snacking options are limited I try to keep homemade snacks on hand as much as I can. This week I tried a new recipe for Barbecue Roasted Nuts from the November 2012 issue of Southern Living magazine. This recipe has 10 ingredients. It takes 2 hours 5 minutes of total time, 30 minutes of which is active and makes 6 cups. I did make a number of modifications. First instead of light brown sugar I used sorghum syrup and instead of granulated sugar I used honey. I have been trying to limit the amount of granulated sugar that I use in baking and cooking and honey is a great substitute. Make sure to stir the nuts at least every 10 minutes while they are in the oven. They will go from browned to burnt very quickly, so be careful. These nuts aren't very spicy so if you are looking for a little kick I suggest adding a 1/2-1 teaspoon of cayenne. The barbecue flavor is nice and even my two kids were fans. One of the best things about the recipe is that it takes very little prep time and makes a large amount of nuts. A great way to make homemade snacks and the flavors can be adjusted to be spicier, more garlic etc. 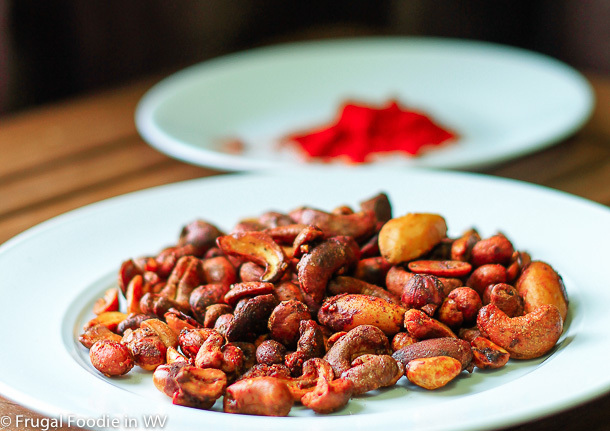 For the recipe go to Barbecue Roasted Nuts. My dad loves any type of nut. I will have to try making these nuts for him. Thanks for sharing! No problem :) If you try the recipe tell me how it turns out! Yum! My hubby and I love to snack on nuts and these sounds perfect! My husband and I love to snack on nuts also, they are a great snack! I never thought to make these, I bet they would be good though. I just got done eating some sea salted cashews, yum! This looks great! I love to snack on nuts and this looks addicting. This looks delicious. I'm going to try it.